SPACE STATION NATHAN: Books in the Mail! I finished the Alamo All-Stars artwork less than two weeks ago, and look, here it is in early printer's proof form! I take these pages and comb through them looking for typos and color corrections, then fix them. In this particular proof, I've got the battle of Goliad switched with the preparations for the battle of Goliad. Whoops. Page numbers are wrong. After this gets corrected and sent back to the printer, we'll do the whole thing again to catch errors. Then it will finally go to print and be in bookstores in March! 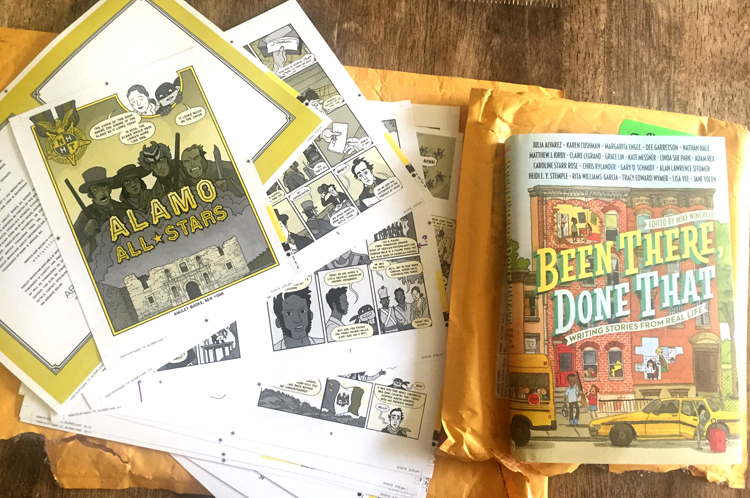 I didn't just get proofs for the Alamo in the mail today, I also received the final edition of this anthology, BEEN THERE, DONE THAT. This is a really cool book of short stories where each author tells a true story, then makes up a fictional story that was inspired by the true story. It's got a lot of great authors, Jane Yolen, Adam Rex, and Matthew J. Kirby to name a few. My stories in the book are NOT Hazardous Tales stories. They are much, much weirder. They involve giant bunnyhead masks. Only read them if you are not scared of bunnyhead masks. This book will be out in a few weeks! November 3rd! Best. Books. Ever. I picked these up for my kids hoping to invigorate their interest in both reading and history. The kids haven't touched them yet (don't worry -- they're a little younger audience than you typically write to ... give them time!) but I can't get enough. Excellent, and SO FREAKING FUNNY!! .... Only a genius can tactfully add crazy humor to an extremely accurate retelling of the Donner party's catastrophe! PS: I live in Utah. Do you ever do speaking engagements/presentations at schools? Do you do school visits? We would love to have you!!! Also, I disambiguated the other Nathan Hale's books from yours on Goodreads (hopefully I got them all?). Feel free to contact me if you need librarian help on there in the future.